Asurion’s Technology leadership is passionate about recruiting top talent from campus. These leaders are committed to building strong relationships with universities and growing Asurion’s presence on campus in hopes of recruiting top talent to participate in Asurion’s intern-to-hire program. At the end of May, fifteen interns joined Asurion’s Technology team in Nashville, TN, Sterling, VA, and San Mateo, CA. These interns will work in a variety of areas within the technology landscape including software engineering, information security, and big data. These internships will expose the interns to a professional environment within technology and also allow them access to real-world, meaningful projects at Asurion. Additionally, the interns will have opportunities to broaden their knowledge and skill set of programming languages, database systems, and other technical programs. These internships are designed to give the interns a glimpse of what it would be like to work at Asurion as a full-time team member. CIO of Technology at Asurion, Barry Vandevier, started his own career in Technology as an intern and is a strong advocate of providing a positive, holistic internship experience to interns during their 10-weeks with Asurion. Through experiential learning, students will be able to apply classroom concepts in a professional technology environment and also build their skill-sets and resumes, all while developing their professional network and having fun too. In addition to their day-to-day tasks, interns will participate in a business case experience, lunch and learns, and other social activities. 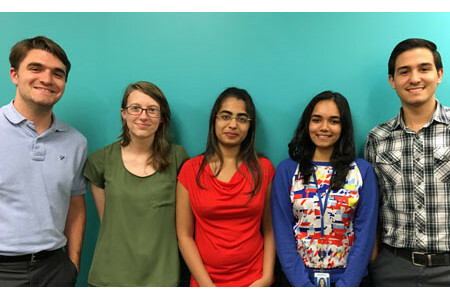 Another advantage to these students interning with Asurion’s Technology team is the possibility of an offer to join Asurion’s Technology team full-time once completing graduation. The business has high hopes that this internship experience is just the beginning of a long-term investment between Asurion and these students. If you have an interest in a career in the Technology field, follow AsurionCareers on Instagram to learn more about the campuses we’ll visit in the fall Asurion on campus and learn more about joining our intern team next Summer! In the meantime, learn more about Asurion and our career opportunities by visiting: careers.asurion.com.